If you are into transport, logistics, shipping or import/export business and want to expand your business worldwide through a website, then you have landed on the right webpage. Here in this blog, you will get some of the best and top class Logistics WordPress Themes which guarantee features like booking plugin, contact form, responsive layout, and other advanced facilities. Plus we have also tested that these themes are easy to customize, user-friendly and any person with basic computer skills can create an attractive website using them. So, let’s get started with the theme details. Logistician WordPress theme provides you a one-page layout with which you can showcase images, business services, blogs and videos on the same web page. This WordPress theme is also equipped with built-in contact form through which customer can forward their messages and queries, testimonial section where you can display client reviews about your services, etc. Logistician WordPress theme will cost you $79. This theme offers developers license, 24/7 support, free installation and demo content. Responsive single page layout which is extremely easy to navigate and looks attractive on different devices like mobiles, tablets, laptops, etc. Pop in & out menu button, contact details, and social sharing icons can be attached to the head section. Full-width slider area which will help you show images of your transportation services with title and text description. Exclusive featured section to project logistic services using font awesome icons on it. Pre-integrated with Google maps to define the location of your business on your website. This is a WordPress theme which allows you to accept online bookings 24/7 through your website. Customers can place shipping orders by feeding simple details in the form of destination, distances, labor cost and other things. An advanced automated system generates estimates charge of the delivery. 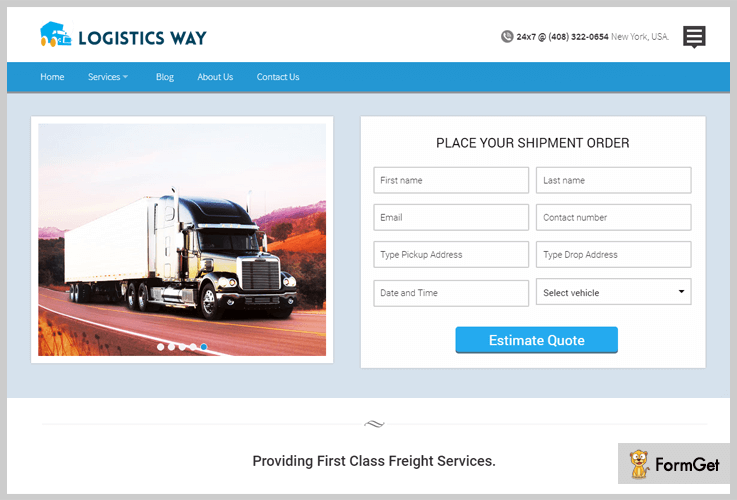 Logistics way WordPress theme allows you to manage driver details, payment info and shipping essentials from the WordPress dashboard and requires no extra software for it. $97 is the price which is charged for logistics way WordPress theme. It includes multiple advanced facilities, multi-purpose usage, SEO optimized and more. 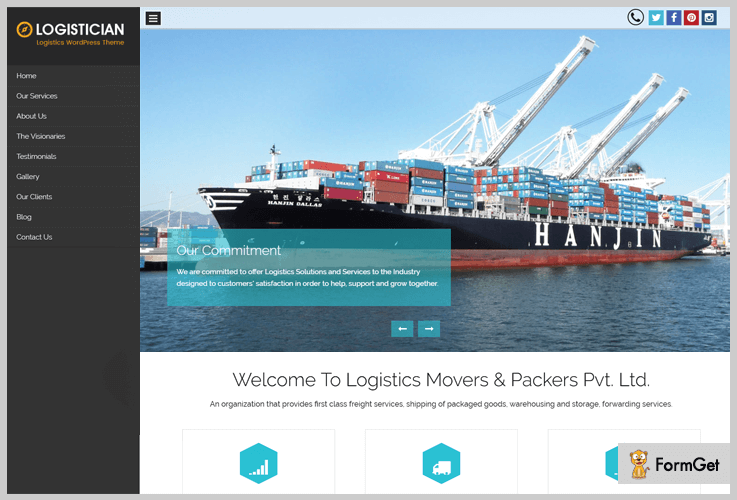 Separate blogs menu section to display blog posts on transport and logistics services. Footer and sidebar areas where you can attach widgets like booking form, recent posts, gallery, contact details and more. You get access to two different types of sliders to display images boxed and full-width slider. Attractive toggle menu which drops in & out with a single click of a button. Cost estimating system which automatically calculates the cost of shipping on the basis of distance covered, vehicle type, labor, and destination. Transportation WordPress theme comes with an in-built lead capture form through which customer leads and information can easily be collected. It is an advanced system which helps you manage, edit, and remove customer details from WordPress backend. You can also showcase blogs, images in the gallery, apply custom colors and more. Besides that, you also get the functionality to add custom CSS and Js codes on your site. For transportation WordPress theme you have to pay $79 for services like lifetime usage, 24/7 support, and regular updates. Tap-to-call button at the top will give mobile users option to make calls just by clicking the button. 6 image slider area which comes with lead capture form attached to it. Dedicated 4-column service section where you can attach images, title and description about the services offered by your business with hover effects. Advanced theme options panel to apply custom design settings like color, fonts, slider images, etc with ease. Allows you to add social sharing button, custom logo, and favicon on the website. This is a specially crafted WordPress theme for people who are into production, delivery, and customization of types, wheels, and rims. 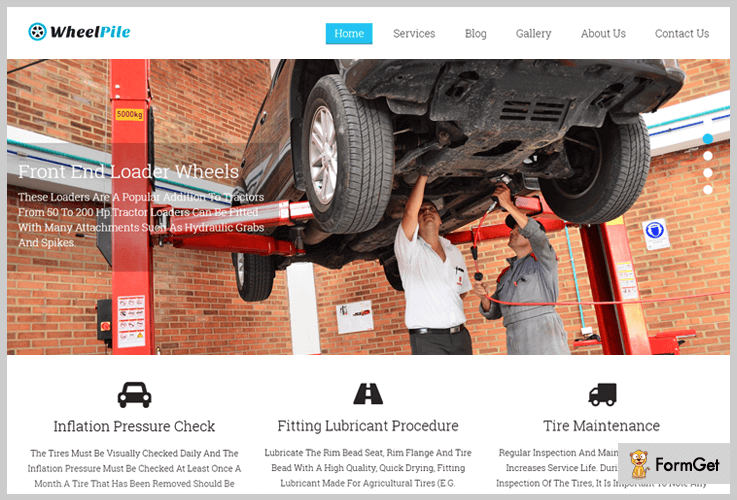 With WheelPile WordPress theme, they can target clients who are in transportation, export & delivery business and need types, wheel related products on regular basis. This theme offers facilities like service area to project services and transport functionalities that your business provides. Call to action button on the homepage where you can add offer links along with other details. WheelPile WordPress theme will cost you $79. This theme will give you developer license, frequent updates, and 24/7 support. In-built contact form which can easily be added to your website. Fully optimized with SEO which helps you rank high on different search engines. Separate options panel where you can write custom CSS for designing a unique website. Offers a responsive boxed layout which is user-friendly and cross-browser compatible. You can publish unlimited blog posts on the website and display most recent posts on the homepage. 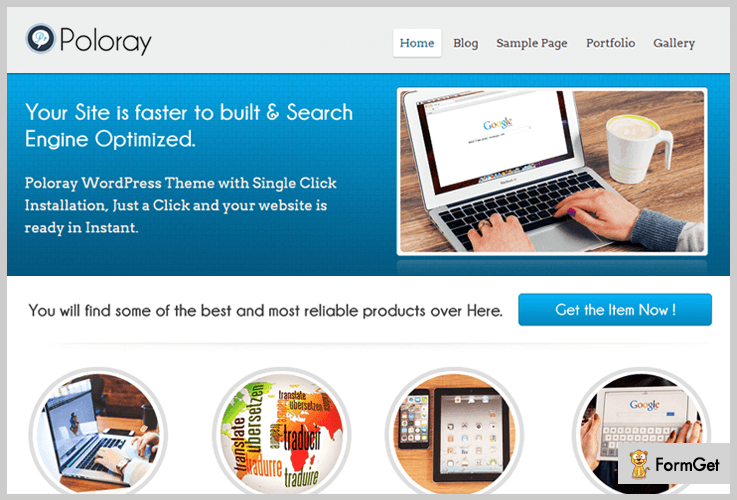 InfoWay is totally free of cost WordPress theme which holds over a thousand active installation all around the world. This theme gives you theme options panel for easy customization, widgetized footer and sidebar areas along with multiple other facilities. 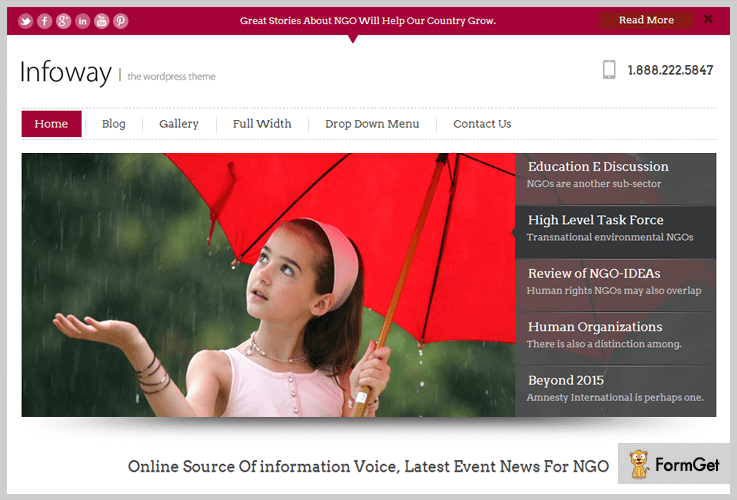 InfoWay is a free WordPress theme which comes pre-loaded with various features & facilities. 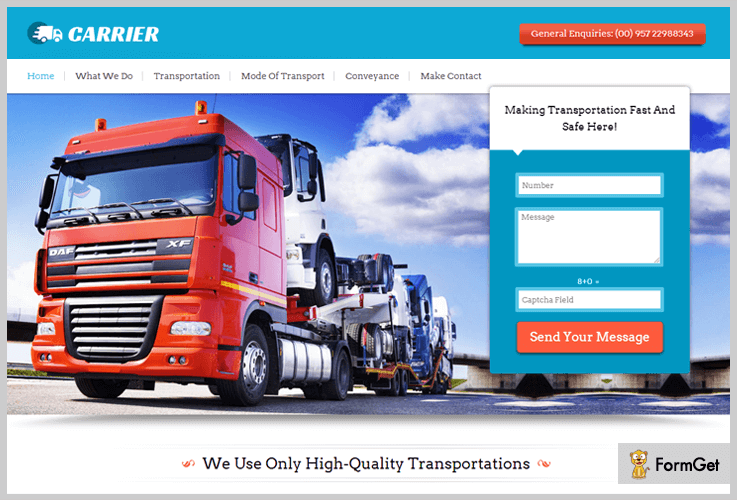 This theme will help you create a custom website to rollout transportation and logistics services on the web. This theme has got 100% responsive boxed layout. You can create multiple web pages and blog posts on your website. Footer and sidebar widget area where you can attach multiple widgets. Allows you to add background images, colors, fonts, custom menu and different styles. With this theme, you can add a custom designed logo, favicon, menu and add contact details at the top. With Poloray WordPress template you can create a simple transportation or logistics website and apply custom colors, fonts, and styling on it. Even though this theme is available for free it offers widget areas, visual editor, plus it is translation ready as well once a plugin is installed. Poloray is another responsive WordPress theme which is available free of cost on wordpress.org. You can simply download it from there and create a custom website for your transport business. The featured area to define the services that are offered by your business. Advanced theme options panel which is easy to customize and apply design changes. Multiple widgetized areas are available in this template. Permits you to add images in the gallery section and allows you to categorize them. I hope this blog will provide you a responsive WordPress theme which fulfills all the needs and criteria of your business website. Finally, if you have any types of doubts or queries in your mind feel free to ask us through comments below.